Ich vermiete ein Ferienhaus am Meer im Südosten von Sizilien (mehr Süden als Tunisi), sehr ruhig, sauber, wohl versorgt und bequem. Ideale Lösung für ein Beruhigungsmittel und wirtschaftlichen Urlaub, daß es dich erlauben wird, zur gleichen Zeit das Meer, das Land und das unendliche verfügbare Kunst und naturwissenschaftliche Vermögen im Umkreis von 150 zu genießen Km wie Ragusa und Noto (Vermögen des UNESCO), Taormina, Etna,Siracusa Piazza Armerina Agrigent Malta etc. Wir waren Ende September/Anfang Oktober 2018 bei Elio. Alles war toll vorbereitet - samt italienischen Spezialitäten. Das Haus ist wirklich schön und geschmackvoll eingerichtet. Der Pool ist toll, auch für Kinder. Letztlich ist alles wirklich so, wie auf den Bildern. Also absolute Empfehlung, wenn man etwas abseits (auf ca. 300 Meter Höhe) einen schönen Urlaub verbringen möchte. We had a wonderful week in the villa, we are a family at 5, parents and "children" at the age of 14, 17 and 21 years. It is a very tasteful decorated and charming villa with a lot of nice and beautiful details - both inside and outdoor. The house and the garden are very well kept and clean. There are several places to relax outside, terraces and lawns, always a possibility to find a quiet corner or shadow. There are enough of chairs, tables and sunbeds, it is a beautiful garden. The pool is fantastic, clean and big enough for a little swim. 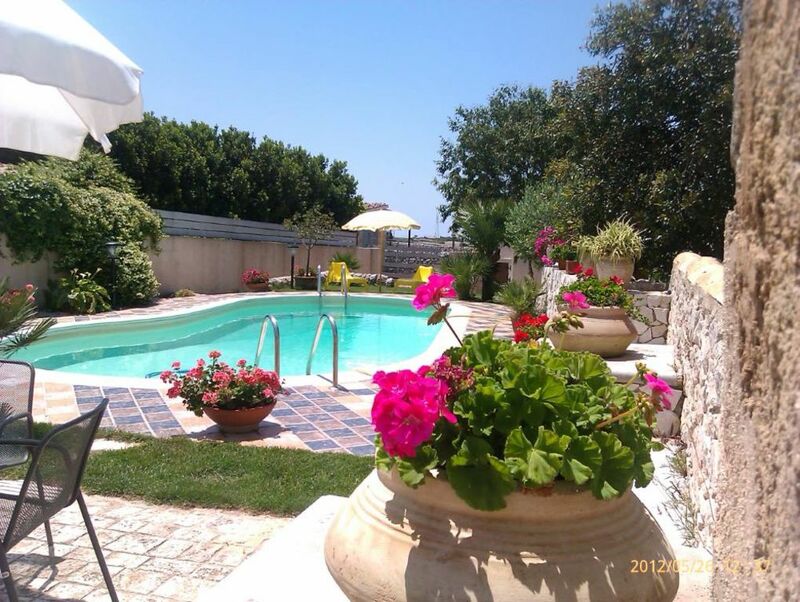 The villa is in the countryside, with a nice view and we enjoyed the beautiful sunsets in the evenings. The house is very well equipped, there is everything you need for cooking in the kitchen and for a normal household - very nice! There is a shopping area in the near, it is easily reached by car. In the other end of the garden there is a little house/studio, where my sister and her family lived, it gave us the possibility to be together, and there was enough space for all of us. Finally, Elio was a very good host, the communication with him was very easy and quick, he was kind, helpful and very generous, we had a welcoming with local specialties, and he gave us information about the area. Thank you Birgitte for your review. It will be a pleasure to accommodate you and your family whenever you want because, despite having spent the holidays in 9 people, you have left everything in order and orderly and this is very important to us when we change from one family to another. You have been ordered and you have allowed the family who came to you to find everything in order. Had a great fortnight at this lovely villa. A traditional Sicilian kitchen (with mod cons), woodburning stove in the sitting room, nice shower room and bedrooms. Everything was clean, well-maintained and comfortable. There's air conditioning too, which we weren't expecting. We really enjoyed the pool and loungers, the balcony with its' great views over the countryside, and the covered eating area to the side of the kitchen. The location is rural, but close to several beautiful Baroque towns with great restaurants, near beautiful beaches, and ancient historic sites a day trip away. For Montelbano fans, the perfect location! Ellio and Giovanna were kindness itself, introducing us to some traditional Sicilian food and wine as a welcome, and giving us advice about sightseeing and shopping (great supermarket nearby made self-catering easy). I definitely recommend this villa and hope to visit again. Thanks Marie for appreciating our home and our hospitality. In Sicily we are very keen to the hospitality and especially Giovanna and I like to establish a friendly relationship with our guests. With you it was easy perhaps because you're also accustomed to hosting tourists in your beautiful country home in Scotland. Giovanna and I just retired we will surely come to find in Scotland. A greeting and we wish you happy holidays from Sicily to you and Jeff.